The Desk is made of solid white oak, stained to your preference and finished in high quality lacquer (satin, semi-gloss or gloss finish). The desks shown are Dark Walnut and natural. Desk and drawer sizes: 44" W x 23" D x 31" H with 2 1/4" H x 14" W x 14" D (Inside Dimensions) Drawer 48" W x 28" D x 31" H with 2 1/4" H x 16" W x 18" D (Inside Dimensions) Drawer 54" W x 28" D x 31" H with 2 1/4" H x 18" W x 18" D (Inside Dimensions) Drawer 60" W x 32" D x 31" H with 2 1/4" H x 20" W x 22" D (Inside Dimensions) Drawer 72" W x 32" D x 31" H with 2 1/4" H x 24" W x 22" D (Inside Dimensions) Drawer Minor changes in dimensions made without additional charges. Or...custom desks are available. All of the surfaces fine sanded, stained and finished with multiple coats of polyurethane. Samples of the finished wood are sent to the customer for approval prior to finishing. The top is made from 4/4 hardwood boards which have been secured together with biscuits and wood glue for maximum strength. The top is secured to the apron with angled brackets and screws. The leg assemblies are secured to the table top in boxed slots by lag screws for maximum rigidity. The two legs are attached together by a cross bar which was secured with 1/4" x 4" lag screws and covered in hardwood dowels. The table ships with the two leg assemblies disassembled. Each piece is individually bubble wrapped and multiple layers of cardboard are used for maximum protection in shipping. Shipping and insurance costs are estimated for delivery to the West Coast. If the cost is less, a refund would be provided. This table comes in Pumpkin Pine, Black, Olympic Green, Dark Walnut, Mahogany, Maple, Pine, Russet Oak, Natural, Cherry or a color of your choice. The finish can be satin, semi-gloss or gloss. Custom item, shipment would be dependent upon backlog. Please specify stain and finish when ordering. 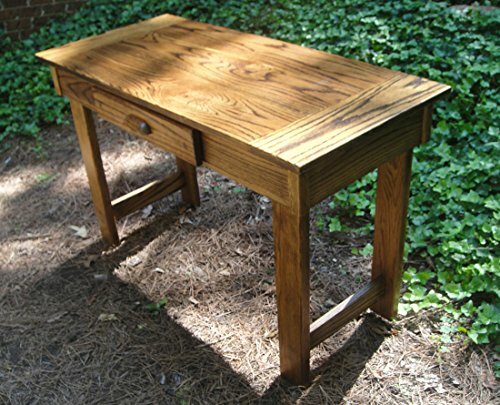 mr² Woodworking also has unique custom furniture, benches, cabinets and specialty wood items.